My organist called to ask if I'd like to hear a new piece she had been working on. Me: Sure. Bach, probably? It's always Bach. Organist: It's not *always* Bach. Me: OK, it's not *always* Bach. But it's Offenbach. Gone Chopin. Bach soon. Offenbach sooner. 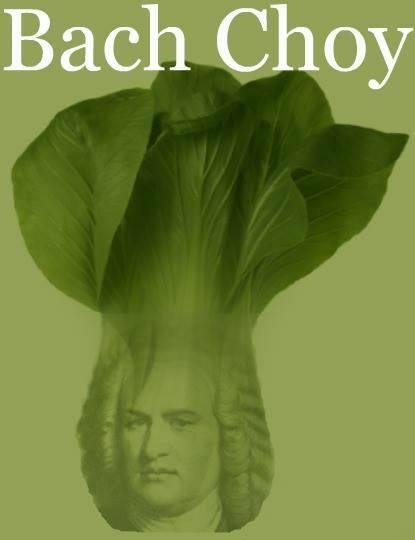 What did Bach have for a midday repast? Why, a Bach's lunch, of course. We went Chopin today and bought a couple of Brahms to sweep the Bach porch with. There was also some Byrd seed on our Liszt. While Part of the way home we saw two little boys Messiaen around and playing Haydn seek in the park. One of them was not as Tallis the other. Then we crossed over the Greene Bridge and stopped at Monteverdi's for lunch. We each had Shephard's pie (and left not a Crumb), topped off with orange Schubert for dessert - and Wolfgang (he Howells at the slightest little thing) was fit to be Tyed (and let us know it in a Mean-tone) when told that we were flying to Britten for the week-end if we could think of a good Raison. We thought, though, that we both should visit the Barber before leaving because our Harris was getting sort of long - plus, George's Handel-bar moustache was in need of trimming. All told, we had a d'Indy time. Oh, and everywhere we went people were talking about the crotchety man (he was of no note) who fell off a clef and lived to tell about it. Fortunatusly, his injuries were minim-al, for which he gave a measure of thanks. But for such luck he could well have been up a Grieg without a paddle. There was (and perhaps still is, not sure) a free (donations accepted) noon-time late spring concert series at Christ Church Episcopal (Charlottesville). mostly of Renaissance & Baroque music that was called Bach's Lunch. And there were light lunches sold in a box (Bach's lunches) that could be purchased, if I recall correctly. I attended several and sang in a few of them, approximately 20 years ago. Our local classical station has a noon time program daily called "Bach's Lunch."